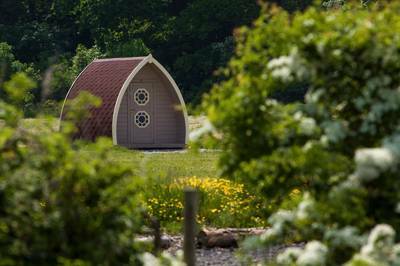 Stay in a colourful, purpose-built glamping Pod, fully insulated and equipped for a comfortable holiday. Sleeping up to 2 adults and 2 children. Stay in a colourful, purpose-built glamping 'bug', fully insulated and equipped for a comfortable holiday. Sleeping up to 2 adults and 3 children. "A tranquil lakeside glampsite just 15 minutes from Blackpool?" you ask incredulously. No dear camper, we're not a few tent pegs short of a full set. The Lancashire Fylde is an alluvial peninsula bounded by the Bowland hills to the east, the Irish Sea to the west, Morecambe Bay to the north and the Ribble estuary to the south. Once harvested for peat by the locals, the land is incredibly nutrient rich and today, a wide variety of flora and fauna abounds. It is here that the industrious folks from Stanley Villa Farm have been busy creating their brand new Camping Bugs site. The colourful purpose built 'bugs' are fully insulated and equipped (though you'll need to bring your own bedding). When your little ones have tired themselves out exploring the sprawling fields (the size of 4 football fields! ), they'll love retiring to their den-like digs for the weekend. 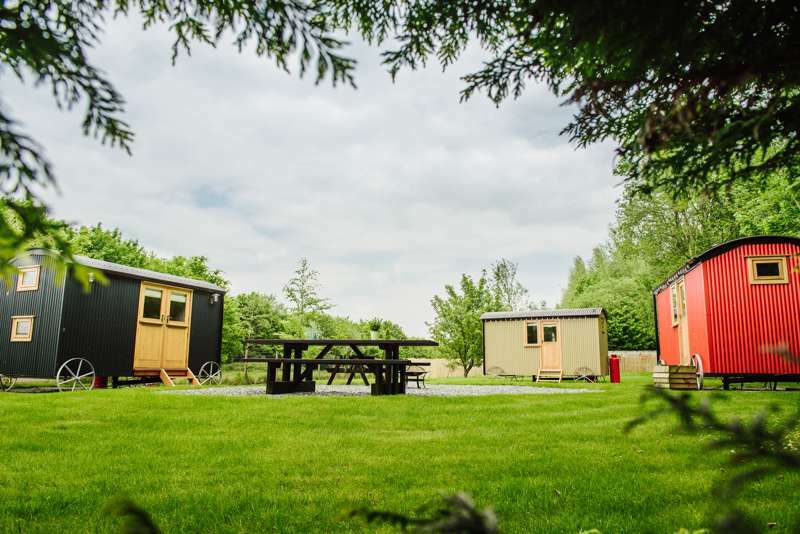 The communal Lakeside Lodge has everything you need for a hassle-free stay including washing and cooking facilities, plus a large common room. The centrepiece of the site is the 5 acre man-made lake. The Flyde Trout Fishery welcomes all levels of anglers to fish the various breeds of trout. It’s also not unusual to see wild deer as well as the usual suspects (rabbits, squirrels, pheasants, and a large selection of birds including; kingfishers, hawks and owls) congregating to sup from its trout-inhabited waters. While not as wild as the fells of neighbouring Cumbria and a touch too far inland to enjoy coastal views, this part of the north-west has its own unique charm. Moreover, it's ideally placed for a bit of rural relaxation. Beautiful rural setting with Fly Fishing lake. Located just 15mins from Blackpool. Specialise in short breaks for families and couples. Cosy Camping Pods are all insulated and come with a battery powered light. Pods also come with their own firepit / bbq and firewood is available to buy on site. Clean modern facilities available 24/7 in our beautiful lakeside lodge. Free teas, coffees, hot chocolates, and even free hot water bottle hire! Rated number 1 in our area on TripAdvisor and won the Certificate of Excellence for 3 years running. For latest availability and best prices for Stanley Villa Farm Camping, please use the Date Search above. Campfires permitted; firewood available to buy. Each pod comes with 2 quality beds and mattresses and is fully insulated. 2 children (or 3 small children) would also fit in a pod, but you would need to bring additional airbeds/ roll mats. Guests have 24hr access to the Lakeside Lodge which has a kitchen including complimentary teas & coffees, a kettle, microwave, toaster, fridge/freezer, three newly fitted wet rooms with toilets & showers, plus a large common room. Power sockets are also available in the lodge for hairdryers and charging phones. The beautiful 5 acre lake plays host to Rainbow, Blue and Brown trout up to 12lbs. Fishing lessons are available to campers. There's plenty of large open fields for children to run and play. The Forest of Bowland, Area of Outstanding Natural Beauty, is a beautiful stretch of rugged, unspoilt countryside covering 312 square miles of rural Lancashire and adjacent Yorkshire. Perfect for gentle walks, mountain biking, bird watching and scenic picnics.Lytham St Annes is a charming conurbation most famous for its world-renowned golf course. A beer festival is held every September and the annual Lytham Proms take place by the town's charming windmill. Morecombe Bayis not too far either.Blackpool is just a 15 minute drive away from the farm. With donkey rides, candy floss and assorted seaside tat, it's a great place to reconnect with the holidays of your childhood. Tourist favourites include the Winter Gardens, Pleasure Beach and iconic Blackpool Tower. Most guests opt to BBQ (on the many free-to-use grills) or rustle something up in the fully-equipped campsite kitchen. The Eagle & Child (01253 836230) offers a fantastic selection of traditional pub grub, and on weeknights has a great 2 for 1 offer on all main meals. The 'real chips' are highly recommended (the spuds are grown locally on Stanley Villa Farm!). The Ashiana (01253 836883) is a superb nearby Indian restaurant, specialising in traditional Bangladeshi dishes. Open till late every night – eat in or collection only. Or if you don’t mind a short 15 minute drive, there is a range of dining options available in Lytham. Try Bosco (01253 733799) for a variety of Italian cuisine. There’s also a range of great pubs and bars with a vibrant atmosphere including CAMRA approved tavern, The Taps. Blackpool has plenty of pubs and restaurants too. Pods: £49 all nights excluding Saturdays and Summer School Holidays (£59). Saturdays in June, July & August £65. This is based on 2 sharing. Additional occupants £5 per child, per night. Dogs £5 per pet, per night. From M6, Junction 32 (Blackpool Turnoff) – turn onto the M55 signposted Blackpool. From M55, Junction 3 (Kirkham Turnoff) – turn right at the roundabout onto the A585 heading for Fleetwood. In half a mile there is an Indian Restaurant called the Ashiana. Take the immediate next left past the speed camera turning down Greenhalgh Lane, 150 yards AFTER the Ashiana and 100 yards BEFORE a Shell Petrol Station. Go down Greenhalgh Lane until you reach a ‘T’-Junction (approximately 1 mile). Turn right and take the second left into the site entrance. Most guests choose to arrive by car as the site's fairly rural. However 'Kirkham & Wesham' Train Station is only a 10 min taxi ride away.